The offseason malfeasance of the National Football League caught up to the games by the tail end of Week One, but there were also games! While video surveillance footage might show what we’ve already known to be true, Week One brought us more surprises than finding yourself to be a human hurdle soon to be trampled. Let’s start with the horror shows. Buffalo and Chicago played deep into their Friday the 13th well, both showing a tenacity to rise from the dead time and time again. Fueled by a perpetual blood-lust, the final machete in the back to the pesky camp counselor for Buffalo was Fred Jackson’s 38-yard run (and two RIDICULOUS stiff-arms) to start the overtime period. That set up the Bills to score the go ahead field goal and continue their reign of terror. In the Atlanta/New Orleans game, there was a battle of supremacy over the Team That Wouldn’t Die. Despite Matt Ryan throwing for a Falcons franchise record 448, they were never able to pull away from the grasp of the Saints as both teams combined for 17 points in the final three minutes of the fourth quarter. Clearly a battle of titans who also just wanted to draw out the entertaining portions of their rivalry. Between Washington and Dallas—once the highlight rivalry of the NFC—the slapstick level was at a City Slickers-high in Week One. The 49ers defense picked Cowboys quarterback Tony Romo apart for three interceptions and sacked him three more times in a first half that was so comical for the Cowboys, it may as well have been accompanied by “Yakety Sax”. Robert Griffin III didn’t have as bad a day as Romo, but the Texans defense kept him flustered and on his toes all game. Even after Texans rookie Jadeveon Clowney left the game with a knee injury, the Texans kept the pressure up against Washington, sacking Griffin three times. Houston also got help on the other side of the ball when rookie Alfred Blue blocked a punt and returned it for a touchdown. Given that Griffin was playing against the Texans, it was prime Marx Brothers material. Oh the warmth of familiar faces doing familiar things. The good old classic movies where the bad guys wear black and a quarterback for Green Bay throws a bomb across his body and into the waiting hands of a defensive opponent. And while this Championship Seahawks team is still relatively new to the scene, their game has become an instant classic. Marshawn Lynch ran for two touchdowns and 110 yards. Russell Wilson went 19 for 28 for 191 yards and two touchdowns. It’s the kind of comfort that can fill up a slow night on TNT for an entire year. Though divisional opponents, the Steelers and Browns haven’t had much of a competitive rivalry in recent years. In fact, Cleveland hasn’t beaten the Steelers in Pittsburgh in 11 years. And while the Browns had a 24-point lead by the start of the second half, the Steelers got the old band back together and put on a show. Ben Roethlisburger went 23 for 34 for a touchdown and an interception, while Le’Veon Bell and LeGarrette Blount smoked their way to a rushing TD a piece. It’s exactly the kind of Steelers win fans have come to expect. Oh, the long suffering Detroit Lions; so many weapons, so many blown chances. And on a Monday night match-up against the New York Giants, Stafford leads the Lions on two touchdown passes to Calvin Johnson and 22 of 32 passes for 346 yards and only one sack. Fans had held their breath for Stafford to finally get over the hill and with the help from his defense, they were treated to a classic Eli face. Having shown inconsistent punishments for players who violate league policy in the offseason by suspending Ray Rice for two games for allegedly hitting his then fiancée Janay Palmer, while suspending Josh Gordon for an entire year for allegedly hitting a bong, Goodell was blasted on Monday morning by TMZ’s full elevator video showing Rice strike Palmer, knocking her unconscious. The NFL released a statement that they had been given access to the video, but TMZ fired back, threatening to release information they received that indicates the league was fully aware of the video contents. The controversy that was supposed to end during the preseason looks like it’s not going anywhere soon, and if the evidence is out there that the NFL knew of the content and lied, the Goodell tenure as league commissioner could end very soon. Jerry Jones is hiring people to build a time machine so he can go back to draft night and pick up Johnny Manziel. The expectations of Clowney as the first pick on an already-stacked defense were sky high. And then the Texans started to dismantle the game of Washington quarterback RG III and you could practically bottle the saliva from drooling Texans fans to then sell back to them later. Then Clowney left with what was first called cramping, then elevated to a knee injury and finally confirmed to be a torn meniscus. He will miss four to six weeks after surgery. Hold the drool. 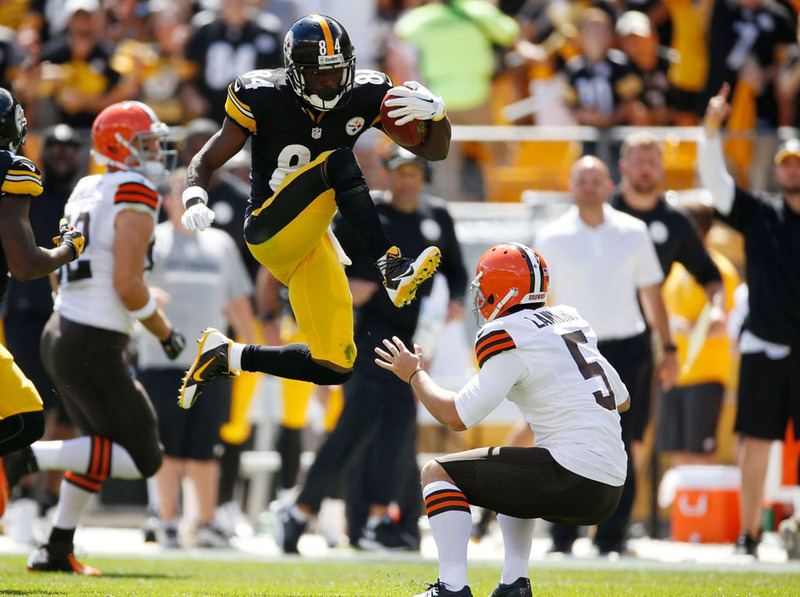 Lanning is the Cleveland Browns punter and while attempting to tackle Pittsburgh’s Antonio Brown, caught a face full of size 11’s (unconfirmed). Brown leapt in the air and karate kicked Lanning in the face, who was obviously protected by his facemask, but it’s a brutal way to start your season when someone from Cobra Kai is taking you out. Seriously, did you see Fred Jackson’s stiff arm? The 33-year old running back for the Buffalo Bills has long thought to be past his prime, but he just keeps giving us gems like this one where he stiff-arms Chris Conte for 10 yards. Staying with the Bills theme, news poured in Tuesday morning that Buffalo Sabres owner Terry Pegula and wife Kim have agreed in principle to buy the Bills, thus securing the team’s future in Buffalo. This was obviously met with excitement by the Zubaz-sporting clan of Buffalonians, including one caller to the local WGR 550 station, who started crying upon hearing the news.